Globally, 740 million women are employed in the informal economy, with limited access to social protection. In Sri Lanka, female labour force participation has been stagnating at around 30% – 35% for many years. In 2017, out of the 8.5 million females who were 15 years and above, only 3.1 million females were in the labour force, while only 2.9 million were employed. Out of this, as many as 1.5 million women were working in the informal sector. In this context, this year the United Nations (UN) celebrated the International Women’s Day (IWD), under the theme ‘think equal, build smart, innovate for change’, focusing on how countries can achieve gender equality and empower women, particularly through social protection systems, public services, and sustainable infrastructure. This year, attention was on technology and innovation (TI) as a tool to achieve the above-mentioned goals. This blog highlights the labour market conditions that hinder social protection coverage for women and examines how TI can help increase labour market access and opportunities for women. 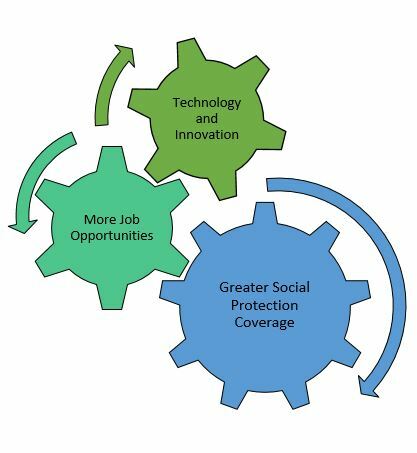 Social protection consists of five major elements – labour markets, social insurance, social assistance, micro and area-based schemes to protect communities, and child protection. It includes policies and programmes designed to reduce poverty and vulnerability, by promoting efficient labor markets, diminishing people’s exposure to risks, and enhancing their capacity to protect themselves against hazards and interruption/loss of income. 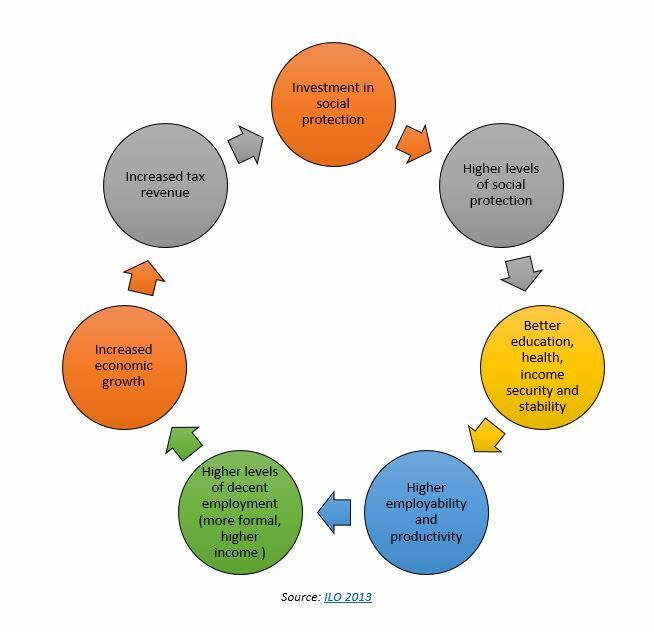 There is a clear connection between labour markets, employment, and social protection, where better labour market and employment conditions guarantee better social protection outcomes. Global statistics clearly show that women have less access to social protection than men. They have lower coverage rates and enjoy substantially lower benefits. For instance, worldwide, only 26.4% of working-age women are covered by contributory old-age protection, compared to 31.5% of the total working-age population. In Sri Lanka too, the proportion of women above the statutory pensionable age receiving an old-age or survivor’s pension, is lower than their male counterparts. Women’s under-representation in the labour market is the main reason for their lower social protection coverage. Apart from that, women’s over-representation in informal employment further hinders their access to social protection. InSri Lanka females represent only 36% of the total labour force while 64% of the employed females are doing informal jobs, according to 2017 data from the Department of Census and Statistics (DCS). Interruptions in careers, shorter working hours, engaging in precarious work due to household responsibilities, and the gender pay gap are some other important factors that limit labour market activities by women thus lowering social protection coverage of females. Opportunities for Greater Access to Labour Markets: What is the Role of TI? 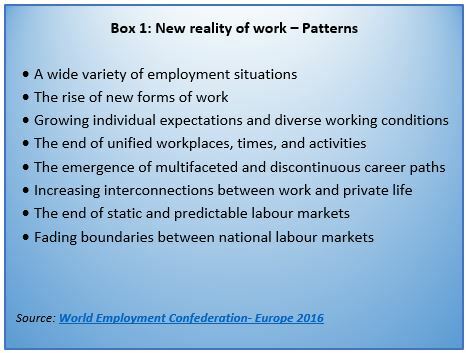 Thanks to TI, new patterns and trends have emerged within labour markets, (Box 1) overriding traditional structures and practices. TI can leverage and facilitate the process of creating better and more jobs and accessing them. New technologies allow for more flexible workplaces, more connectivity, and opportunities for digital work through home offices. As such, the definition of ‘the workplace’ is changing. It expands beyond physical work premises to include anywhere the worker goes in the performance of their duties. These new patterns and trends are paving new avenues and opportunities for women to overcome the traditional barriers they face when accessing labour markets. In this context, it is crucial to find ways in which technology and innovation can improve women’s access to the labour markets and better social protection thus accelerating the progress for greater gender equality. Flexibility and choice - TI gives more flexibility and choice in deciding where, when, and how to work. This is beneficial to women as it boosts their employment rates. It is no surprise that countries which have highest shares of women working from home also have the highest maternal employment rates. Also, gender pay gaps tend to be lower in industries where working arrangements are more flexible. As mentioned before, this leads to greater social protection. More time for formal jobs – TI can be used to automate household work, which is still the responsibility of primarily women in most societies. This would release their current dual burden and allow them to use their skills in the formal labour market, according to the World Economic Forum. This would give them a chance to earn means of social protection through work. 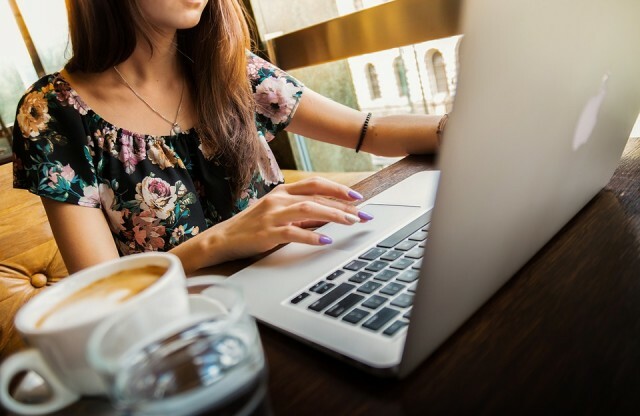 Overcoming cultural barriers – online job platforms with an international reach provide opportunities for women to work and earn in countries where cultural barriers or rules make it difficult for them to work in the formal economy. TI to formalise the informal sector - TI can be used as an agent to empower the informal sector, by creating scalable platforms that provide informal sector workers with more secure income, employment benefits, and social protection. With the expansion of smartphone usage and internet access across the world, there are many initiatives taking place to capture the informal sector’s workers into the formal system. One such interesting initiative in Sri Lanka is ‘Tea Integrated Payment System’ (TIPS). A ‘Smart Tea Card’ is introduced which can be used as a payment card as well as a procurement card for tea factories and green tea leaves suppliers. Through this card, the factory can electronically keep a track of weight of green tea leaves supplied by each supplier and make payments to the suppliers via electronic remittances. The ease of tracking and recording earnings and other transactions has made it easy for them to access the benefits of a formal labour market such as social protection coverage and access to bank loans. Did the Blue-Green Budget Forget Migrants and their “Greenbacks”?